For his second long player, John Coltrane (tenor saxophone) joined forces with his Prestige labelmate Red Garland (piano) to command a quartet through a five-song outing supported by a rhythm section of Paul Chambers (bass) and Art Taylor (drums). The absence of any unessential instrumentalists encouraged a decidedly concerted focus from Coltrane, who plays with equal measures of confidence and freedom. The Coltrane original "Traneing In" Is a rousing blues that exemplifies the musical singularity between Coltrane and Garland. Even though Garland, the pianist, takes charge from the start, the structure of the arrangement permits the tenor to construct his solo seamlessly out of Garland’s while incrementally increasing in intensity, yet never losing the song’s underlying swinging bop. Chambers gets in on the action with an effervescent run that quotes the seasonal favorite "Santa Claus Is Coming to Town." The poignant "Slow Dance" is a dark ballad with a simple, refined tune that is established by Coltrane, then turned over to Chambers, then Garland, before the tenor brings it home with one final verse. Coltrane’s second original composition "Bass Blues" showcases Chambers’ ability to mirror even the most intricate or seemingly improvised lines from Coltrane. And "You Leave Me Breathless" provides everything that a love song should with long, languid runs by Coltrane, Garland and what is arguably Paul Chambers at his absolute finest. The album draws to a close on a bebop lover’s dream — a fast and furious interpretation of the Irving Berlin classic "Soft Lights and Sweet Music." 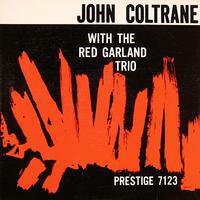 The original album title and cover with its abstract painting was changed in later pressings to "Tranein’ In," and revised to show a monochrome portrait of John Coltrane.